Everyone is full of happy marriage wishes, wishing the newlyweds all the best and a long and happy marriage. Weddings are a very happy time for everyone, especially the bride and groom. Unlike most occasions, finding a wedding gift is easy. Many brides have set up a registry, so you just pick something from the list. Since in most cases the new couple has much to desire, you can buy just about anything and rest assured it will be something they need. Cash is also a very popular wedding gift. Nothing helps the newlyweds out more than cash. Many new couples actually get enough cash to put a down payment on a house. Every gift that is given has a purpose. Towels are for enjoyment for all the baths and showers the couple will have. Wine glasses are for sharing a good vintage with friends, and a salad bowl set is for all the healthy salads they’ll eat. But along with your gift, you are also giving wishes, happy marriage wishes. You can say the words. You can include a note that tells them how much happiness you wish them. You can hug them that same moment you give them the gift. Or, you can include a special little gift that says it all for you, that puts your desires close at hand to continue and grow the relationship you have with them. Give them a gift that solidifies your feelings, something that will always bring you to mind. Give them captured wishes. Captured Wishes are all of your deepest heartfelt wishes bottled up in a unique glass vessel. It is so chic – filled with precious thoughts, your feelings, about future hopes for the couple. It perfectly expresses how you feel. 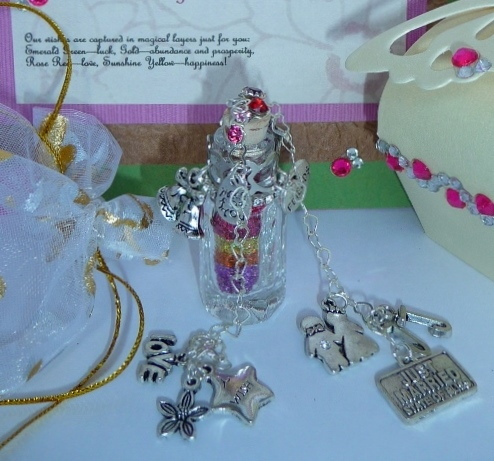 It’s a complete gift package; your emotions are eloquently expressed in creative verse compiled with just the right words, layered “magical dust” that represents individual wishes, and pewter or bronze charms and heart-link chain. All to be held in the palm of one’s hand. Each and every gift from Captured Wishes is a hand crafted creation, a one of a kind gift created in the spirit of wishing the best for the two who will be joined as one. These Happy Marriage Wishes are super cute and elegant tiny glass bottles, filled with “magic dust” in specially selected colors that symbolize your sincere wishes of health and happiness. Your unique wish bottle is then securely packaged and shipped straight to you. You will be thrilled by its style and elegance, and in complete awe that such a simple little creation can carry such a gigantic message. You won't find anything like this anywhere. So different and distinctive is this idea, you are guaranteed the couple will not receive another gift like yours. The newlyweds are guaranteed to be absolutely delighted. The next time you want to send someone a Wish (or two, or three), choose the chic and unique gift ideas from Captured Wishes. Custom made orders such as the one above are welcomed! Any occasion, any time of year, chic and unique gift ideas created by Captured Wishes are always a great choice. You can give it as a stand-alone gift or as an additional bonus to that special gift you have decided to give. 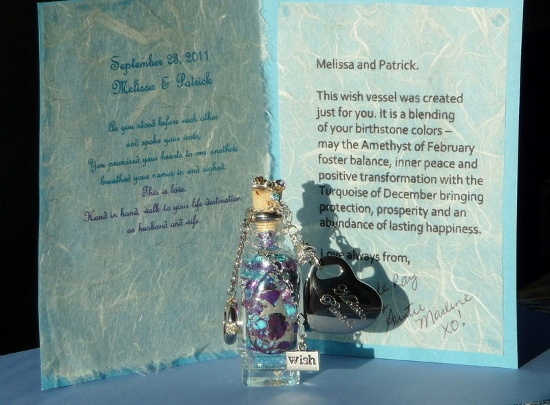 Wedding Wishes from Captured Wishes are sure to be a huge hit.